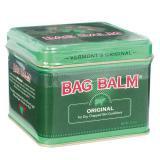 Bag Balm® enables rapid healing of chapped skin (of both animals and humans) and superficial abrasions. Originally created to help soothe and protect dairy cattle udders from the harsh climate of Vermont, its efficacy and versatility became legendary and was soon being used by consumers. Product Dimensions: 3" x 3" x 2.4"
For use on cattle and sheep to keep skin in damaged area moisturized. Helps soothe cuts, scratches, skin irritations and abrasions. Contains lanolin and thus lasts longer than most other types of ointments. 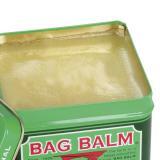 Massage thoroughly and allow ointment to remain for full softening effect. For pets, apply liberally to the affected area. For use on cows, thoroughly wash treated teats and udder with separate towels before each milking. To avoid contamination after each milking, bathe the udder with plenty of hot water, strip milk out and dry skin. 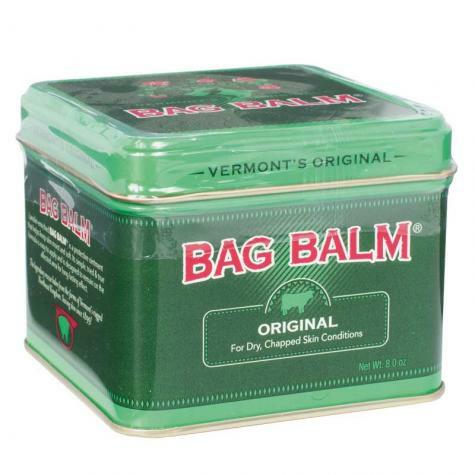 Apply freely and massage gently with this proven ointment twice daily. After each milking, apply thoroughly and allow coating to remain on surface. Discontinue use if rash or irritation occurs. Keep this, and all medications, away from children. Jim V from Langley B.C. A classic that is still the best on the market.